The MS Victor Hugo is part of the fleet CroisiEurope. On board this ship will experience the magic of sailing along the Rhine and Danube and you will witness the wonderful cityscapes reflected in their waters. 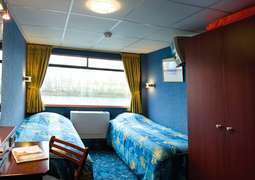 The CroisiEurope offers its guests a welcoming environment with a variety of cabins furnished to give you maximum comfort. You have the choice of booking a single, double or triple cabin, depending on your needs and preferences. CroisiEurope offers the opportunity to dine with the other guests on board while enjoying fine French and other international specialties. During breakfast you can help yourself to the delicious buffet with a variety of specialties. The lounge and bar is the perfect air conditioned place for our guests to indulge in conversations. You will have a wonderful time on the Promenade Deck enjoying the breathtaking views passing before your eyes. Onshore you can explore the city as well as relax at its beautiful rivers and immerse yourself in the various regional cultures. On board we would like you to feel much more at ease, for this reason we strongly recommend that you dress very practical and comfortable on board. For the gala dinner, formal dress is required. Due to the space and safety aboard the MS Victor Hugo you max bring a baggage no more than 20 kg, as well as a small hand luggage.